Ann starting the fireworks, Odyseas Marina style! Most of these Easter photos are courtesy of Yannis, more are available here, here & here. Just two weeks after moving house, we flew out to spend a fortnight's holiday aboard Pipit in the Ionian. 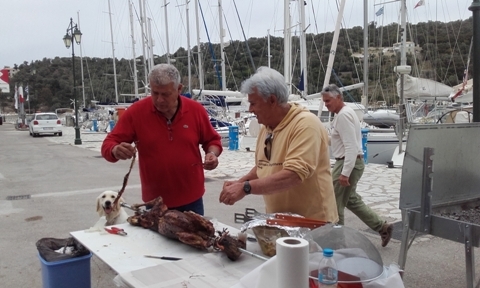 We timed our visit deliberately to allow us to be on Meganisi for Greek Easter, a very special time of celebration in Greece and one we had experienced only once before but wanted to repeat. This meant that we had to fly into Athens as it was before the seasonal flights started to the local airport in Preveza. We hired a car for the fortnight which made the five and a half hour journey twixt Athens and Lefkas much easier than taxis and coaches (and hardly any more expensive) as well as giving us our own transport for the duration. Although bright & sunny during the days the weather was unseasonably cool, particularly in the mornings and evenings of our first week, with most Greeks wandering about in hats, coats and boots. Oops, didn't pack much in the way of warm clothes and we'd left none aboard. Thank goodness for Pipit's Eberspacher heating (for those non-sailors, this is a diesel hot air heating system) as well as the electric radiators in many of the tavernas! By the start of our second week the temperatures had increased considerably. Pipit was in good condition when we arrived, needing just a good wash to remove the winter grime, which we did the day after our arrival. We delayed washing the canvas (stackpack, sprayhood & helm cover) as there were two days of thunderstorms forecast and we know from experience that these, particularly at this time of year, can deposit lots of brown rain, undoing any cleaning we may have done. The thunderstorms came and went, not without incident, although nothing involving us and, thankfully, nothing involving anyone being seriously injured. Yannis and a couple of others went to the rescue of a charter yacht whose alternator belt had failed (so therefore no engine cooling) off the east coast of Meganisi and we heard that two brand new charter catamarans ran aground north of the Lefkas canal, between the northern end of the canal and the channel into Preveza. We haven't yet heard the full story but understand one of them sank completely. As it happens we saw one of the catamarans the next week when we took Pipit up to Preveza. The catamaran (the one that hadn't reportedly sunk completely) was being salvaged by a barge close inshore. 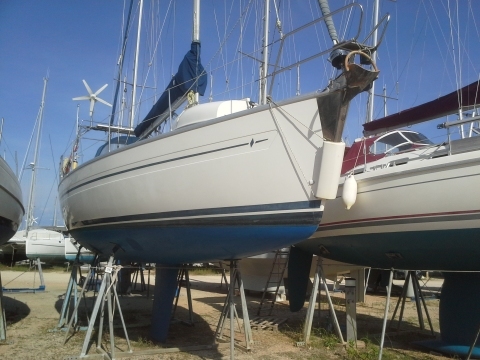 We saw her again when the catamaran was brought ashore at Cleopatra Marina on the barge and also the next day when she had been taken into the boatyard. 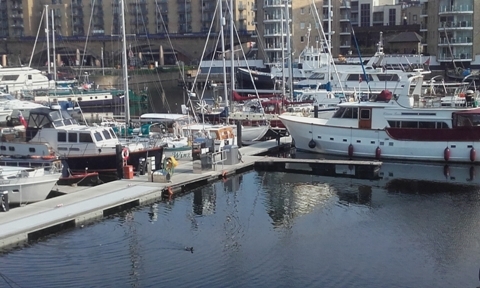 There was a significant amount of damage to both hulls, with the port keel being very badly damaged and the hull holed, as well as the port rudder and propeller being missing. She must have been taking on a significant amount of water and no doubt the episode would have been frightening for those involved. A sobering reminder of the power of the sea, even in what many think is the 'gentle' Ionian. We enjoyed catching up with friends as well as doing some cleaning and maintenance on Pipit during our first few days and just relaxing after our house move, which had been stressful and tiring to say the least. 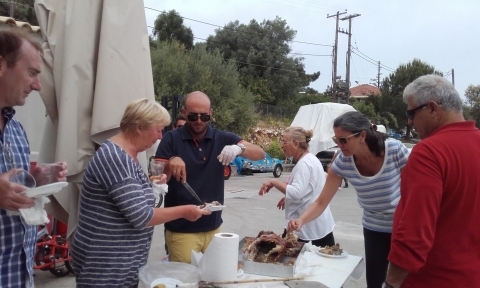 The warm welcome back we received on Meganisi was genuine and wonderful, and reminded us why we love the Ionian and Meganisi in particular so much. Easter really began in earnest on Saturday with a daytime procession celebrating the first resurrection being quite a noisy affair with people trailing empty olive oil drums, pan lids and the like from their cars, mopeds or just by hand as they walked through Vathy, banging makeshift drums, tooting horns and shouting Christós Anésti (Christ is risen). We gather the amount of noise is to highlight the joy of the faithful about the resurrection. Yannis explained the various traditions of Greek Easter to us - I hope I have the detail correct, much of which I've tried to double check with the help of Mr Google, but apologies if I've got anything wrong! The next phase of the celebration was new to us as we were invited to go into the church to watch the late night mass which is the official end to Lent. It was formal but without the routine of sitting, kneeling and standing that I was used to from my Catholic upbringing. The church was candlelit and very atmospheric and it was genuinely moving despite being incredibly crowded with standing room only and even more people waiting outside the church for their chance to spend a few minutes inside. As the service ended, candles which people had brought into the church were lit from the candles inside and brought out of the church where the flame was passed from lit candle to unlit candle - signifying, we gather, passing the light of Christ to others. Everyone then processed to the square in Vathy where they continued to say Christós Anésti to one another, hugging & kissing in their sincere joy of the occasion. It was very special to be part of all this and see all generations enjoying the whole celebration in a truly heartfelt manner. The Odyseas Marina bunch ready to head to church. Lent being over, Easter Sunday was a day of feasting with virtually everyone having at least one (Yannis arranged two!) 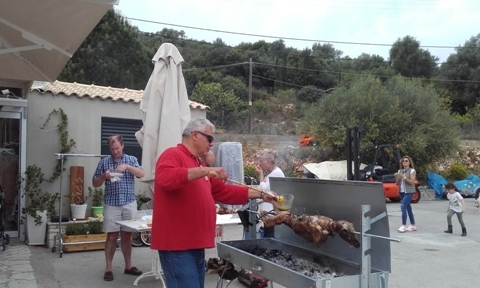 whole lamb on a spit, roasted slowly over coals, basted with lemon, rosemary and garlic, plus meat in various other forms including kokoretsi, a sort of kebab made from offal. Tasty but, like Scottish haggis, it's best not to ask too many questions about the content and don't Google it if you have a weak stomach... Few vegetables featured in the fayre of the day with the exception of delicious potatoes roasted with lemon, olive oil & rosemary and baked jacket potatoes sprinkled with oregano & sea salt. 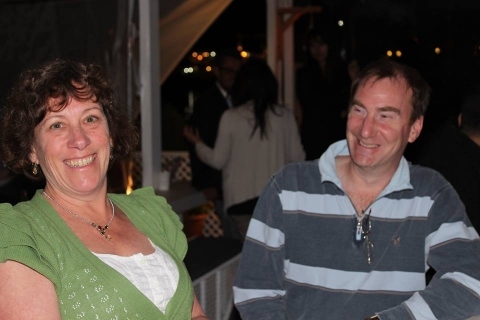 A fabulous feast, dancing, drinking and an absolutely fantastic day! 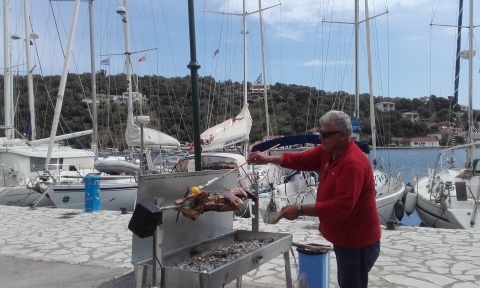 Basting the lamb in the idyllic setting of Odyseas Marina. Not a day for vegetarians! 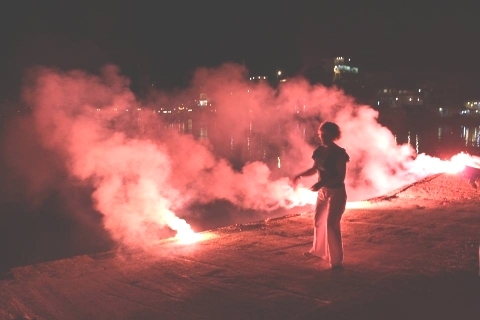 Greek Easter is certainly not the commercial chocolate & bunnies affair it has become in many other countries, although one of the traditions for Sunday involves a bit of fun and competition with hard-boiled eggs which have been dyed red, but even this has a serious meaning. Monday involved mostly resting and not eating until the evening - salad for everyone I think! With half our holiday over, it was time to return to some work on Pipit as well as planning where we'd tuck her up for the summer. Andy was pleased that for the first time since Brittany, he could do the annual engine maintenance without breaking into a lather of sweat! 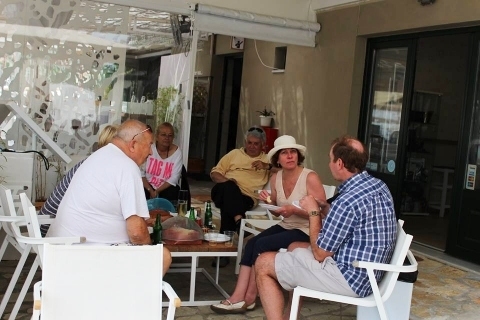 It seemed an enjoyably longer break than the ten days that had passed before we slipped our lines from Vathy and headed north to Cleopatra Marina at Preveza. We spent a day there before having Pipit lifted out into the yard, subsequently spending a few days in one of the handy hotel rooms on site while we tucked Pipit up safely until our return later this year. 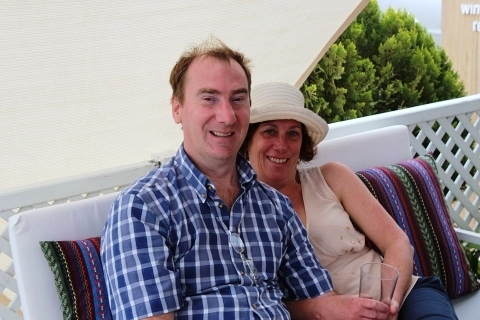 It was also lovely to meet up with our friends Alan & Jane from Peregrine 8 who were preparing for several weeks cruising the Peloponnese - fair winds, have a great time and we look forward to seeing you back in the Ionian in the autumn. Although our return flight was at midday, we travelled back to Athens the day before to avoid having to leave very early in the morning, rushing and hoping the traffic wouldn't delay us. 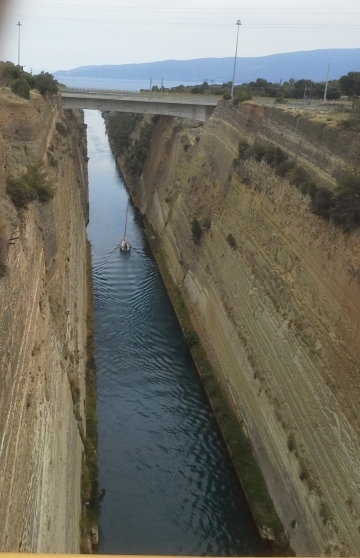 We took the opportunity to stop at the Corinth Canal - simply amazing and one of the, if not the single, most expensive canal transits per nautical mile. 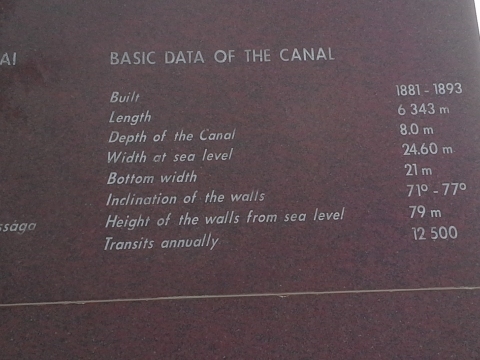 At one stage we had thought of making that passage but, for now at least, that plan is on hold. 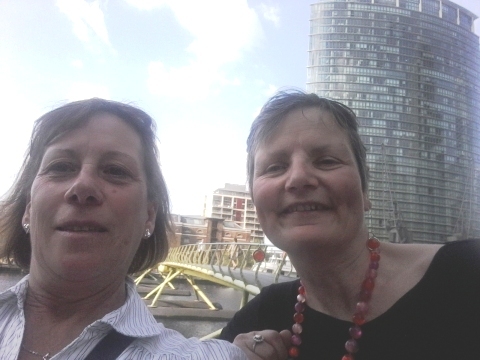 The day after we flew back to the UK, I was off to London to spend a few days at CA House undertaking some training with Sue, from whom I will be taking over the reins of Web Editor in August. As Andy had worked in that area of London in the past and had given me directions and tube station details, before I knew it I was in my cabin in CA House! I had a great time, thoroughly enjoying both the work and the social aspects. The London section happened to be having a supper in at CA House on one evening, to which I was kindly invited by the Section Secretary and I had a lovely evening meeting and chatting with other cruising sailors. During my visit I also had the opportunity to meet some of the other CA staff, including Camilla, the editor of Cruising, the CA magazine - thank you all for making my visit so enjoyable. What an utterly nice bunch of people - I do know it's not all socialising but I'm going to like this job! The view from my cabin balcony at CA House - a great way to start a day at the office! 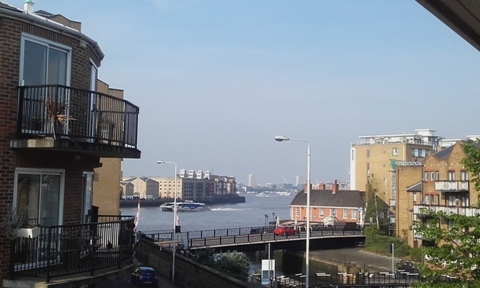 Camilla and I had a lovely stroll in the very warm evening, walking along part of the Thames path to Canary Wharf and the Crossrail development. Not much in the way of conventional rail lines or trains visible at present, but a very nice East meets West garden in the development that is (or will be) Canary Wharf station. "Take a selfie" Camilla says... Who gave me the extra chins? I returned from London on Friday and, having dealt with the chores & admin that were absolutely essential, we spent the weekend making the most of the glorious spring weather. We treated ourselves to a new wok (the range cooker in our new house has a wok burner) from the Kitchens Cookshop in Bath, then visited St Aldams Nursery to buy some bedding plants, herbs, tomato & chilli plants followed by a lovely barbecue on Saturday evening. Sunday, despite the forecast for cooler weather was equally beautiful, so it was on with the walking boots and off to our 'local', the Queen Matilda pub for a very convivial afternoon. It took us only an hour to walk there and, surprisingly, despite taking the longer and more arduous route home via Gatcombe Park only an hour and 5 minutes to get back home. Our Asian style shredded beef (recipe available here that we'd put into the slow cooker was ready for our dinner, just the wraps to warm, spring onions, cucumber & red pepper to slice and the wine to open. A truly lovely weekend! 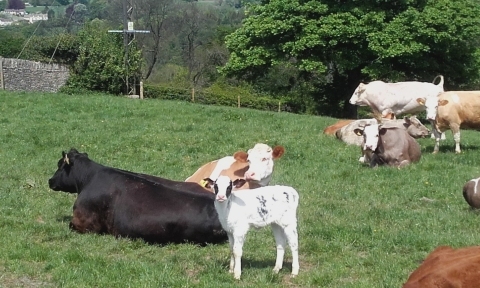 Some very young calves in a field through which the footpath passes. 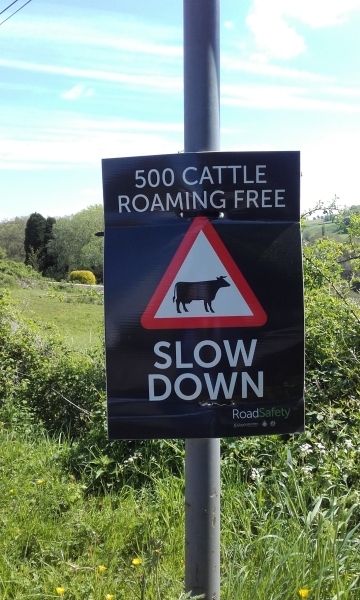 Cattle have been released onto Minchinhampton Common now, although the reflective collars they were fitted with last year to alert drivers to their presence and avoid them being hit have been replaced by various warning signs. Do drive carefully if you pass this way! Back to work then on Monday - we're both busy with lots to do, but also have plans for the next few weekends.